Visalia USD's Patricia "Petey" Smith recently offered up a bevy of recommended technologies designed to help make primary educators' jobs easier and their teaching more effective. "Name your challenge," said Patricia "Petey" Smith, kindergarten teacher in California's Visalia Unified School District. "We have challenges everywhere we look." Those include larger class sizes, the shift to Common Core standards, an increase in high-needs students, less parent participation in the classroom, a test-driven focus for instruction, and more. But Smith is determined to use tools and technology in the classroom to help her meet the individual needs of her young students. Recently, during the Fall CUE 2013 conference, Smith presented her "primary picks," programs that have made an impact with her children. Here, she shares 11 programs worth exploring. Everything in Smith's classroom is a tool that can be used to help a child learn. For example, she maintains a set of five "old computers" that she won't allow IT to remove as well as a blackboard that helps the children "feel the motion of that letter" as they're writing it out. But not everything is dated. She also has a set of five newer machines for use by the students. She has positioned all of the computers to have a view of them from wherever she sits, so she knows the students are working "in the appropriate place." Smith also has one "coveted" iPad, as well as an interactive whiteboard and a document camera that she has situated "low to the ground," because her students are the ones who get to use it. She keeps an older CD player, which she's still using, and she has her Apple Nano, for when she needs music. Finally, she maintains a "handy-dandy" digital camera to capture learning as it happens in the classroom. Smith calls Starfall "tried and true — the most used Internet place we go. My kids are learning to read from this." 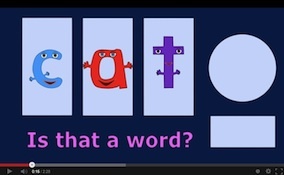 She finds the free service especially helpful to get kids over certain "holes" in their learning — such as how short vowels sound or how vowels are affected by "e." The learner can learn a specific letter or phonetic sound through audio, animation, and text. She especially likes the "I'm Reading" section that allows students to practice reading both fiction and non-fiction. To help students find their way to the right place, she laminates screenshots and shows them to the student: "This is where I want you to be today." She adds, "This is my second teacher in the classroom when I have a class of 30." Smith also purchases a subscription to More.Starfall.com, for about $2 per student, which gives her access to "Backpack Bear's Books," which she tears out, staples, and gives to her kids. When they successfully read the story to an adult in the classroom, it goes into their book box to keep for their own. Plus, the premium service includes other subjects such as numbers and math operations. Although ABCmouse reading academy costs parents to access, it's free for teachers in the United States and Canada. The site includes reading activities along with books, music, art, math, and social studies and science. Smith likes the site because it includes a lot of fiction and non-fiction texts that students can work through independently. She can also personalize a lesson by dragging activities into a lesson builder function. She can set highlighting of words and speed of audio, along with a "what did you learn on this page?" feature. When Smith finds a video on YouTube that she'd like to share with her students in the classroom, she doesn't want the commercials to come along too. She relies on SafeShare.TV, a free Web service that generates a safe link when the URL of the video is pasted into it. "Then, when the video comes up, you don't have to worry about inappropriate things showing up too," she said. Before (left) and after SafeShare.TV. Smith is continually seeking out new online resources to introduce into the classroom. To keep them at her "fingertips," she uses symbaloo, a free visual portal for Internet pages. As she explains, symbaloo lets her "collect and curate all the things I like." In particular, she's always hunting for resources that will help her teach concepts. 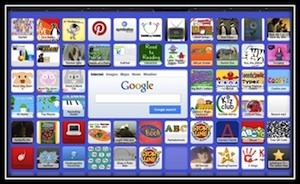 When she discovers a new Web resource, she creates a tile and puts it into her symbaloo collection. She also searches symbaloo for resources uncovered by other kindergarten teachers that have been hashtagged #kinderchat then chooses "View this Webmix." When she finds a useful resource that has been saved to somebody else's symbaloo page, she copies that file to her own mix. Frequently in the past, new discoveries just got lost. "Now I have a place to store them all," she said. To stay in touch with what other teachers are doing, Smith uses both bloglovin' and Pinterest. bloglovin' allows her to follow her favorite blogs. Anytime those bloggers update their sites, she's informed through a daily e-mail that shows all of the new content. "I can scroll down and see if there's anything interesting. I'm not twittering; I'm bloglovin'." Smith likes Pinterest for the same reason. "I'm an old teacher. I still like new ideas." Currently, her "Petey Smith" account has 38 boards for language arts, Smartboards, class technology, social studies, and personal topics too. When she finds something she likes, she "pins" it to keep it handy. Only recently has Smith begun participating in Teachers pay Teachers, an open marketplace for educators. The idea is that members can upload digital lessons, books, or activities they've created and make them available for others to use. The first upload has to be made freely available, and then participants can charge from that moment forward, as long as they have a PayPal account for managing the transactions. Smith's free upload (under "Petey's Picks") is a reading goal and progress graph that can be edited. But she's also selling an editable teacher plan book for $4. In her first three weeks, Smith said, she had sold 12 items. When she's a shopper rather than a seller, Smith uses filtering options to hunt down specific resources that other teachers have found useful. "If I'm searching for 'shapes,' I can go here and search to get all the things for shapes — 17,985 results — or narrow it down to 'kindergarten' and 'price free' to get only 1,300 results." From there, she can sort by rating, best-selling, or most recent. The site, she adds, is a "wonderful way to get more things." Smith said she doesn't buy a lot, but Explain Everything is worth its $2.99 price tag for iPad and Google Android tablets. This design tool allows the user to annotate, animate, and narrate explanations and presentations for interactive lessons, activities, assessments, and tutorials. She has used the app to explain concepts such as nouns. She created an activity with various nouns and photos and three categories: person, place, and thing. As a group, she and her students talked about what a noun was; then she had each learner come up and sort out which category each image belonged in. Another app she's purchased ($2.99) for use on her sole classroom iPad is Peapod Labs' ABC Wildlife, which "keeps the kids entertained, and they learn a lot about animals." The collection includes links to a hundred-plus videos showing animals and has interactive scenes with touch activities. The same company has produced similar apps about bugs, food, music, house, aquarium, farm, and other topics. Smith likes to use two augmented reality apps with her students that help them learn and delight them at the same time. 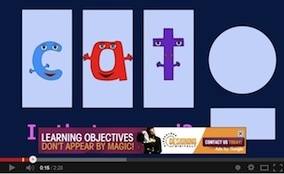 AR Flash Cards from Mitchlehan Media is a free app that works with free downloadable flashcards. The teacher downloads and prints the flashcards in color, opens the app, and presses "Get started." The app opens a camera viewer. When the student places a flashcard in view of the camera and touch the tablet or touch device screen on top of the animal, it announces the letter and name of the animal, and the animal pops out of the card. It's available for iOS and Android. colAR App from Puteko allows the student to color a special sheet with ordinary crayons, coloring markers, and coloring pencils. When the tablet is held over the image, the subject of the picture comes alive in the same colors and moves on the screen. The basic iOS and Android app is free, as is one set of coloring pages. Other sets of pictures can be "unlocked" with the $2.99 purchase of a full version of the app.